Renaissance Capital points to a strong possibility that 2019 will be a record $100 billion year for IPO proceeds, passing the 2000 record of $96 billion. The question is are there going to be enough investors to take in the flood of stock hitting the market, especially in this era of indexing and passive investing. Wall Street is excited that a major part of the capital markets business is finally starting to function after a better than four-month hiatus. After months of waiting, the 2019 IPO pipeline will finally open on Thursday with Levi Strauss. It is a perfect moment for the long-stalled IPO market. 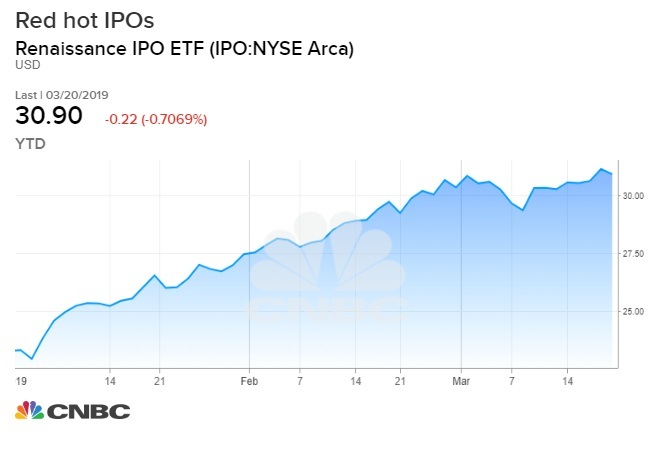 Investors are salivating at the ocean of well-known names seeking to go public: The IPO market has continued to rebound since February, and the Renaissance Capital IPO ETF (IPO) is up a whopping 32 percent this year, more than double the S&P 500. 1. The pipeline is getting ever larger. Renaissance Capital, which tracks the IPO market, counts 37 companies in registration targeting $10 billion of proceeds. But that's just the beginning: Renaissance has 234 companies targeting 2019 IPOs with valuations of nearly $700 billion, with a strong possibility that 2019 will be a record $100 billion year for IPO proceeds, passing the 2000 record of $96 billion. It all sounds terrific, but there's a simple problem: Who's going to buy all this stuff? "We are concerned about how the public markets will absorb all this issuance," Kathleen Smith from Renaissance Capital told CNBC. Her point is that the market is very different than it was 20 years ago. There are fewer individual investors. Many don't even have brokerage accounts. They have financial advisors who do asset allocation using index investing and ETFs. These financial advisors often aren't even stock pickers and don't follow the IPO market. They are asset allocators. "The era when your broker called you up and said, 'We've got a hot deal for you,' is mostly over," Smith said. "It appears to us like private valuations are very high," she told CNBC. Sure looks that way with Lyft: the last round of funding was $15 billion, and now the ride-hailing company is reportedly trying to get $23 billion. "We have a hard time coming up to that number," Smith said. While early IPOs with reasonable valuations (Levi Strauss) might do well, the broader worry is that as the number of IPOs increase into 2019, lower quality companies will be coming and there will be less pricing discipline. That's when we could see problems: "That's how the market could roll over. In IPO land, the market builds up a head of steam, and then everyone loses pricing discipline," Smith said. The tidal wave of offerings could take investment away from the broader equity market and slow down the rally. Several traders expressed this concern, and on the surface it seems to make sense. There's only so much money out there invested in public markets. But is a $100 billion investment in IPOs, which is the top end of the expectations, really enough to slow down the stock market? Smith doesn't think so: "Our studies show that early in the IPO market recovery, returns are typically good for investors because the issuers will be higher quality companies offered at reasonable valuations." She cited Levis Strauss as a good example. And think about this: Alibaba was a huge deal, and it didn't kill any rallies. Regardless of the concerns, Wall Street is excited that a major part of the capital markets business is finally starting to function after a better than four-month hiatus. How excited is it? There's a sign on the floor of the NYSE today: "Reminder Trading Floor Community: Thursday, 3/21 Wear BOTH your Jean Jacket & Jeans." Twenty feet away, at the bottom of the stairs, there is this sign: "Blue jeans are not permitted on the trading floor."